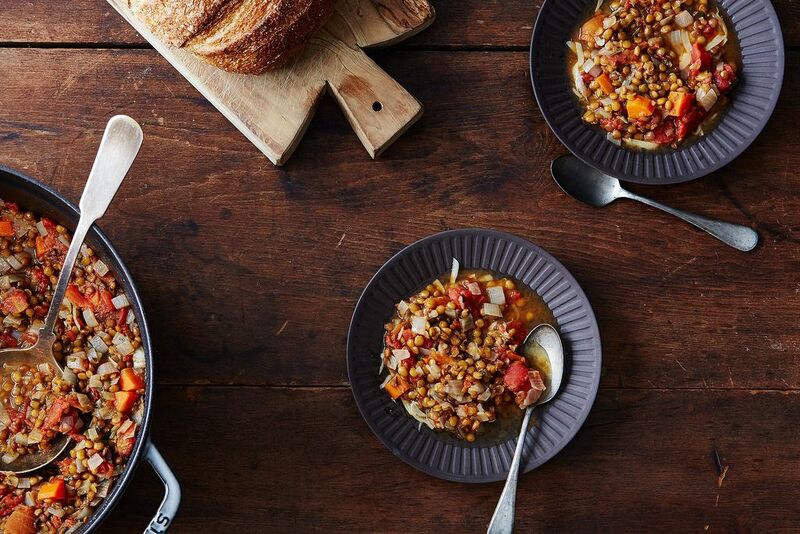 Today: Make a richly flavored lentil soup from nothing (and then tip in some sherry, for kicks). Until the very end, this recipe seems to be an exercise in austerity. It's not like lentil stew has ever been a meal of wild excess, but this one is even more restrained: For a still-not-completely-clear reason, the title describes it as being made "Monastery-style," from Frances Moore Lappé's groundbreaking Diet For a Small Planet, a book full of ways to turn spare ingredients into elegant vegetarian meals. 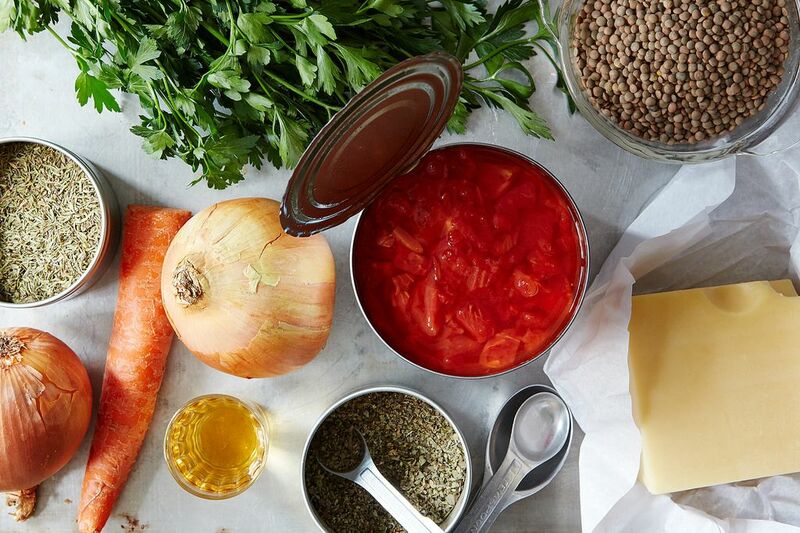 The ingredients are plain and available everywhere, in every season, for next to no money: You use any old lentils, cellar staples like onions and carrots, canned tomatoes, and dried—yes, don't try to get fancy—herbs. There is no saffron, no cured meat, no finishing salt. It takes little time to put together, and even less precision: The vegetables can be about any size you like; you lump the ingredients in together in a few un-micro-managed batches: fresh vegetable chunks, then dried herbs, then everything else. But then the stew simmers for 45 minutes, which isn't a long time, but still twice as long as lentils usually take to cook through. 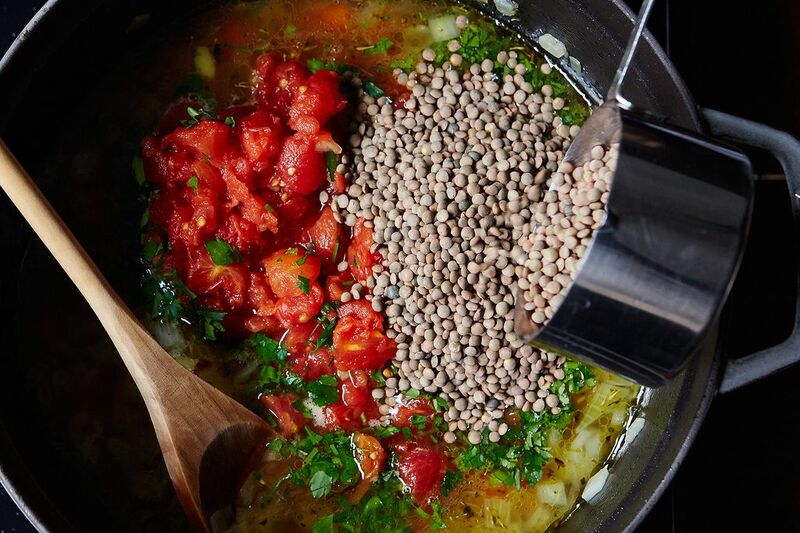 This gives the flavors time to develop and penetrate—but how do the lentils stay intact, without gelling into a shapeless mush? Well, remember when we learned you shouldn't cook legumes with acids (like vinegar or lemon juice) because it keeps them from softening? 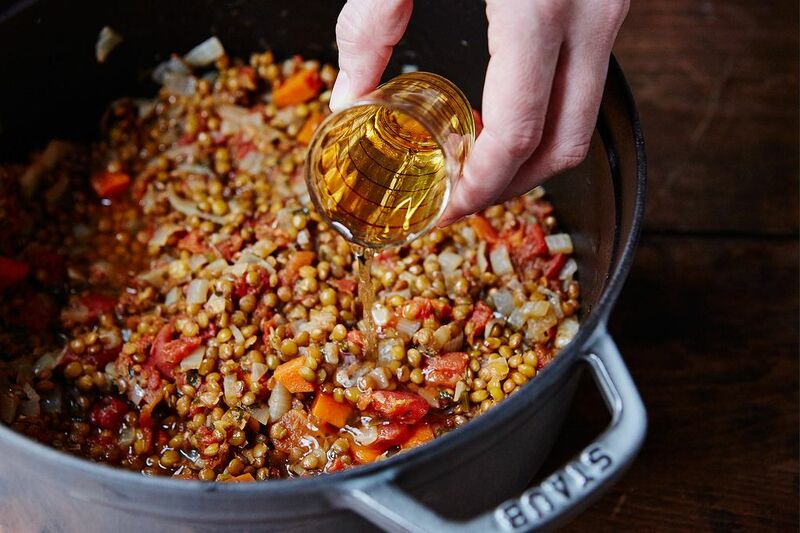 The same is true here, but there's just enough acidity in the tomatoes to get the cell structure in the lentils to hold on a little longer, giving them enough time to turn into a soulful soup—fit for a monk, fit for you. We'll be instructed by Lappé to serve the lentils over a pile of grated Swiss cheese, so that we may form a complementary protein. But here's where is gets a bit funny, and just a little more genius: At the very end, off the heat, you dump in a good amount of dry sherry. The alcohol doesn't cook off, so the soup ladled in front of you stays boozy and fragrant and smacking not one bit of sacrifice. 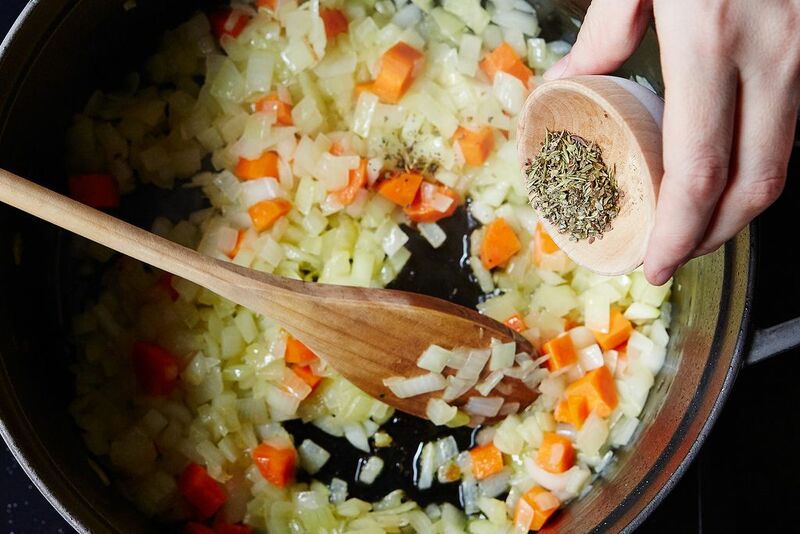 If you instead want to simmer away more of the alcohol, you can—it will curb the sharpness of the booze and sweeten it a little, but won't suffer in flavor. Either way, maybe don't serve this to babies. Or monks, for that matter. Got a genius recipe to share -- from a classic cookbook, an online source, or anywhere, really? Please send it my way (and tell me what's so smart about it) at [email protected]. Thanks to Food52er Cindyatbeach for this one! Since we found this recipe, I've been making it almost weekly as soon as the weather is cold enough. It's a household favorite. I tend to use red wine instead of sherry and I like it just as much. We normally opt for a nice conté or gruyère on top. We've made this soup for almost 40 years now. I always add at least one more carrot and often some celery. If you're a meat eater, try adding a bit of left over pot roast or beef brisket. It melds in perfectly with the lovely earthy flavors. Continuously in rotation in my life since Ms. Lappé wrote Diet For A Small Planet, it stands up to the test of time! Made it last month for post-Christmas supper with my brother's family (such a relief to eat something simple after a season of rich food! ), but used fancy French lentils and Emmenthal cheese. Do use good Sherry, it makes the dish. I always make a pan of cornbread to go with (with some grated orange rind for flavor and slivered almonds for crunch). Amen to serving with cornbread! Outstanding recipe! 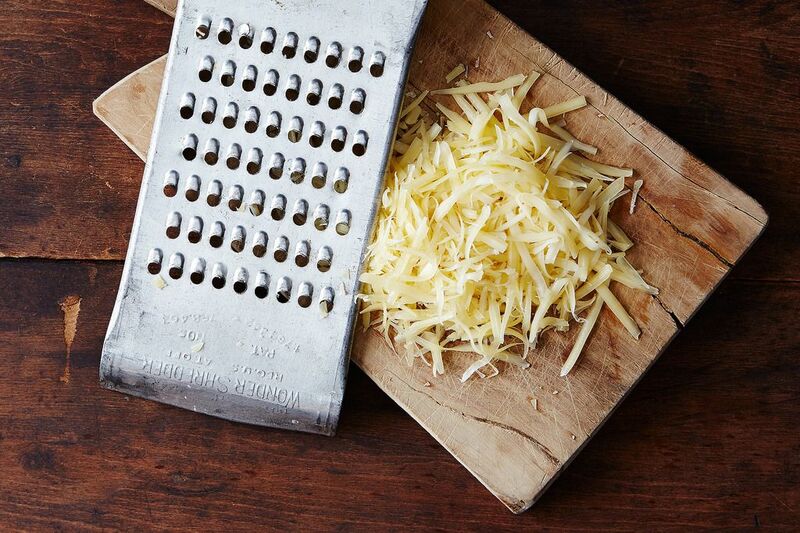 Do try it exactly as written, with the Sherry and grated cheese. They make the dish. I won't mind buying another bottle of Sherry just to make this recipe. And I crave leftovers... it's THAT good! Love it! Had this for supper a couple nights ago and my husband and I both loved the soup. It was super filling, delicious and tasted like I had gone to a whole lot of trouble - but it was easy as can be. Used a bit more tomatoes and broth (because my can/box were bigger than recipe called for) and the soup came out just great. Put a couple containers in the freezer for a later day and already my husband has requested I defrost a container. Yum! This is the go-to meal when the shopping hasn't been done or I'm too tired to do something challenging. I have been making it for decades and my parents learned about it from me and also made it regularly. The sherry adds another layer of flavor, but is not essential. Blessings on your house and everyone in it, for posting this treasure. I, too, ate this dish all through college and my early working years. I lost the recipe, but what a delight to find it here! I've tried numerous other recipes for lentil soup, but this one remains a stand-out. I've been eating this my whole life! It was a classic Sunday lunch growing up and now that I'm older, it is the meal I make to "break in" a new kitchen. I began making this soup a million years ago, broke and in grad school in Boston, and have never ceased to do so. With or without sherry. On three continents, and numerous homes. Broke and not. It is one of the meals we eat. In the Diet for a Small Planet is another recipe that I love and have made for years. It's called the ultimate "Egg Salad" . It is a vegan fake egg salad made with tofu that is to die for. oh thought I misspelled it, old eyes! I have made a slightly tweaked version of this in the crockpot for, um, decades. Don't use sherry, but cook with a good glug of red wine, add tomato paste, a Parmesan rind if I have one, and cook all day on low. Monday night staple. If I have a flavorful sausage, preferably Trader Joe's basil pesto chicken, I will chop it up and brown it and throw it late in the game. this post made me smile! especially the last few lines. i was planning on making it for some babies this week but I guess i'll sub in some pureed peas or something. I love genius recipes, but can you find it in your heart to never again use the word "seminal"? I'll consider it -- but why? If this is NSFW, feel free to message me directly! I find it objectionable because it's so terribly gendered. I love words and language, but I dislike how it equates the genesis of something good with something inherently male. Might seem like a small point, but subtle word choice can have a big impact. Sold. Thank you for sharing your thoughts -- I just updated the article.